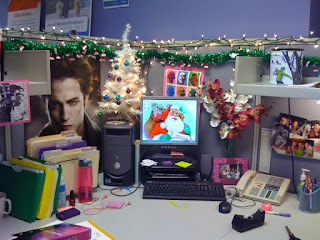 Here's my cubicle all Christmas-ed up. Tree, lights, sparkly garland...feels cozy in here (well, almost). ♪ It's beginning to look a lot like Christmas! ♫ If this were a video you'd hear my holiday cheer playlist. Sometimes when "Santa Baby" comes on the playlist I sing it to Edward who's always an armslength away. Note the Wintery tin on the shelf. It was once full of 5 lbs of chocolate covered popcorn. Now there are around 4 kernels. FML. 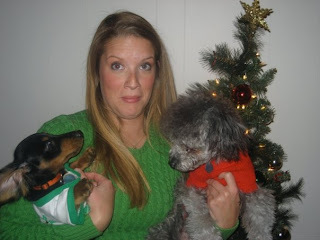 Another random tidbit...This is a blooper shot from last year's Christmas card photoshoot. The Prince and I got all gussied up in our Holiday best to take our card picture. My friend, the camera-woman, was over with her Dachsund, Dignan. Dignan lept into the frame and Chuy got so mad/jealous that he snarled and bit Dignan. I felt like Michael Vick in the middle of it all. This year I'm hoping the Prince minds his manners at Christmastime. Maybe he just thought Dignan was going to drink all the Egg Nog. I'd probably bite him too. Continued Merry Chirstmas to all!